Everywhere you look today you see roasted seaweed snacks for sale. When I attended the Fancy Food Show in San Francisco last month you couldn't turn around without running into another seaweed snack booth. The market is getting crowded and the problem is that most of these taste the same. If you love seaweed snacks, then a little variety can spice up your snack time. Seaweed snacks can be an acquired taste. I don't usually eat them myself but my daughter cannot get enough of them. If I let her, she will sit down and eat a whole package. My son will eat them also. He doesn't go crazy for them like my daughter but he still enjoys them from time to time. I always review products from a whole family's point of view but my kids were the main judges on this one. My wife and I also tasted them but I was most interested to see if these would work in school lunches. Annie Chun's sent me two flavors to review, but in addition to those, their line also includes Sesame and Wasabi. We started with the Brown Sugar & Sea Salt flavor. They were sweet and definitely a different taste. My wife and I didn't prefer this flavor but my kids loved it. They kept grabbing the snacks, and when I went to change the flavor, I was lucky my hand didn't get taken off. Their vote was a resounding "thumbs up!" The second flavor we tried was Cracked Pepper & Herbs. My kids both said they were too "spicy." However, my wife and I really liked these. They weren't spicy as in hot, just seasoned well. If you don't normally choose seaweed snacks, I would give this flavor a try. My wife and I both gave these a "thumbs up." So there you have it, a split decision. I will keep the Cracked Pepper & Herbs for myself and send the Brown Sugar & Sea Salt to school or serve them for healthy after school snacks. If you want to serve your family something a little different, try Annie Chun's Seaweed Snacks. Even if you don't normally eat roasted seaweed, you might just be surprised with what you find! 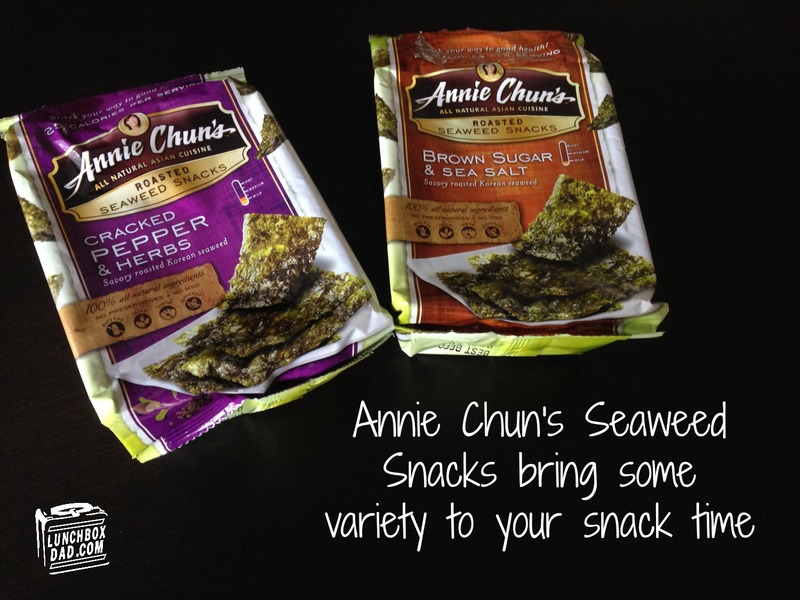 You can see all of Annie Chun's Seaweed Snacks at www.anniechun.com. Disclosure: Annie Chun's gave me their product to review. I have received no other compensation for this post and the opinions I’m expressing here are solely my own. These look tasty! Thanks for the review! Thanks for reading, you should check these flavors out!